This rosewood marquetry table exemplifies many design elements of the Regency style, an English furniture style dominant between 1800 and 1830. The round table top is attached to a pedestal base supported by splayed legs terminating in lion’s paw feet, all of which are characteristic of the Regency style. The brass inlay decoration was also a popular feature during this period. Symmetry was another important component of Regency design. Close examination of the inlaid decoration reveals the pieces of veneer used for the large dark petals were cut from the same piece of wood. The use of the nearly identical cuts of veneer placed opposite each other further demonstrates the importance of symmetry in the composition. The tilt-top table design allows the top to be tipped into a vertical position, either to save space or display the decorative design on the table top. The table top was severely warped and the warping had dramatically distorted the shape of the table top. There were two large cracks associated with the warping which ran across the table top through both the veneer and solid wood substrate. Warping is generally caused by the shrinking and expanding of wood caused by the loss and absorption of moisture with shrinkage being inevitably the worst. On a piece of furniture such as this, there are many layers and inlays of different materials that react differently to moisture and temperature changes and the subsequent movement and stresses. The marquetry design suffered from various forms of damage. 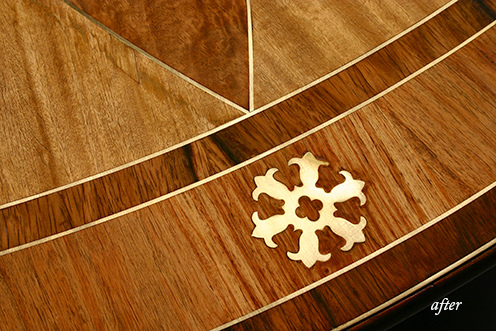 The veneer used for the inlaid design was cracked and delaminating throughout the table top. Additionally, many of the metal inlays were lifting. Dark green corrosion was visible on the surface of each of the star-shaped metal inlays. The finish was very thick, cracked, and was crazing throughout. This damage along with discoloration flattened and obscured the marquetry design. The finish and marquetry surfaces of the top could not be treated satisfactorily without taking care of the warping and extreme cracking. Treating only the warping and separation cracking would expose more areas of delaminating veneer and metal inlays and do more damage to the finish. Sometimes a minimal treatment is possible, in this case not treating the underlying structural problems would doom any surface repairs to quick and inevitable failure. Luckily in this case we had a client that understood this and approved the full treatment. Treatment of the table required many months. The first step was to return the warped top to its original profile and stabilize the large cracks. The top was disassembled from the pedestal and the frame and apron were removed from the underside of the table top to allow access for structural repairs. Several butterfly reinforcements were installed underneath the table top along the cracks to stop further separation. After the cracks were repaired, the warped areas were treated. Grooves were cut into the underside of the solid wood substrate and long wedges of wood were inserted into the grooves. 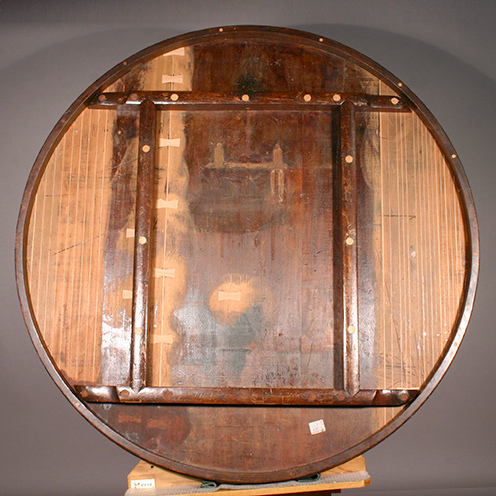 This along with a combination of heat, moisture, and gradually applied mechanical pressure allowed the compression of the table top back to its original form. A lacquer sealer was applied to the underside of the table top as a protective barrier coat to avoid moisture transfer and prevent future warping. Once the structural repairs were applied to the underside work began on the top. All accessible loose and delaminating veneer was reattached. The losses along the cracks were filled with wood where ever possible and filler where not. After the structural repairs were applied to the underside and the veneer was stabilized as much as possible the finish could be safely removed. The surface was washed with the minimal amount of solvent necessary to remove the deteriorating finish without removing the wood patina. The surface was gently sanded and the corrosion was removed from the brass inlays. At each of these steps, the veneer was checked to see if any additional consolidation was necessary. Frequently when extensive repairs are done, additional obstacles arise. In this case, the metal inlay lifted in several areas after the top was reshaped. The shrinkage of the wood left the brass rings too long to fit into their original settings. 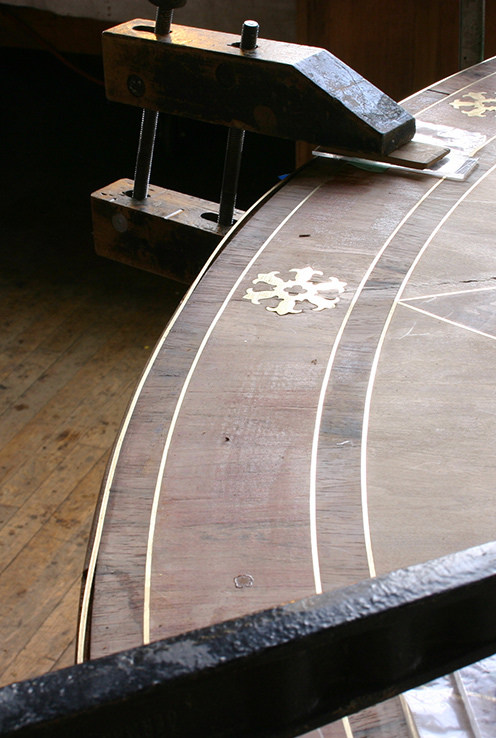 In order to adjust the length, minimal cuts were made to the brass rings. Once all of the wood and metal surfaces were stable the finish could be treated. All areas of repair and in-fills were toned to match the surrounding original finish. A new finish was applied over the entire top using a French polish technique. This technique employs hand rubbing shellac, an alcohol-based finish. The structural treatment of the warped top improved stability and will reduce further deterioration. 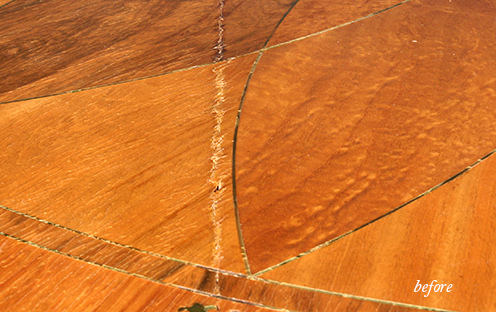 The cracks across the table top remain visible, but do not disrupt the marquetry design. Removing the old, thick deteriorated finish and applying new finish brought out the contrast of the different wood species. The removal of corrosion improved the clarity of the design by enhancing the brightness of the brass stars and outlines and adds longevity to the metal. Overall, the treatment was a success by returning the table to a stable and functional piece of furniture with a striking design restored to its original splendor.